Noodles and pasta are two very delicious food items that are loved by people of all ages around the world. Kids especially adore different recipes using noodles or pasta because of their yummy taste and flavors. There are people who remain confused between noodles and pasta because of their similar tastes. Yes, there are many similarities between these two food items though there are also differences that will be talked about in this article. Pasta is a food item of Italian origin and is a generic term used to refer to a variety of dishes made using unleavened dough. Mixing wheat flour with water and giving this paste various shapes gives birth to the food item called pasta. It is the dishes made from these sheets after cooking that are loved by people around the world. 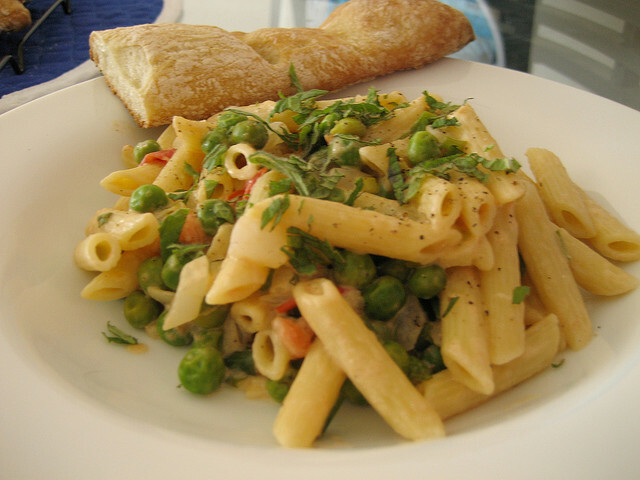 In addition to wheat flour, pasta can be made from the dough of grains and cereals too. There are also varieties called fresh pasta where eggs are added to make the dish. However, it is dried pasta that dominates the recipes made of pasta around the world. Noodles are of Chinese origin and perhaps the most popular staple food item around the world that is used for not just snacks but also for meals. Noodles are made from unleavened dough of wheat. One characteristic feature of noodles is their shape as all over the world they are found in long and thin strips. However, there are also available waves, strings, tubes and many other shapes of noodles. Noodles are very easy to cook as all they need is boiling water to become soft and edible. However, there are also people who like them fried. Noodles are mostly made form wheat flour though there are also noodles made of rice, potato, acorn etc. • Pasta is of Italian origin, whereas noodles are of Chinese origin. • Noodles are mostly long and thin while pasta comes in a variety of shapes. • Noodles are oriental in nature, whereas pasta is a western dish. • Noodle can be considered as a type of pasta. What about northern European noodles?